There are many colorful yarns about W. Lee “Pass the Biscuits Pappy” O’Daniel. With his hillbilly band the radio flour salesman won two terms as Texas Governor. And then Pappy became a Senator by orchestrating one of the most spectacular campaigns and controversial vote counts in Texas history. O’Daniel again defied the experts and vexed the Texas political establishment when he was re-elected as governor. After another over-the-top spectacle of an inauguration, it was back to business for O’Daniel. That meant back to battling the newspapers and the legislature and not getting much done. Bill Crawford, the author of “Please Pass the Biscuits Pappy,” said O’Daniel’s radio listeners seemed not to mind his ineffectiveness. 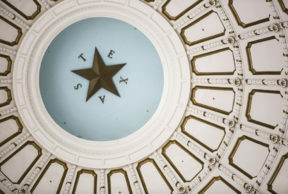 Meanwhile, the state’s debt had ballooned to $25 million and the federal government was threatening to withhold Social Security pension contributions unless Texas shored up its contributions. Four months into his second term and things looked bleak for Pappy. But then there was a twist of fate. In April 1941, U.S. Senator Morris Sheppard suddenly died of a brain aneurysm. And it was O’Daniel’s job to appoint his temporary replacement. “Pappy by that time thought, ‘Hey it might be cool to be a senator.’” He didn’t want to appoint someone who could run in the special election as an incumbent – so who did he chose? A gentleman called General Andrew Jackson Houston. He was 87 years old. He was the only surviving son of General Sam Houston,” said Crawford. The selection was a cynical farce. The frail Houston was sworn in on June 2 and was dead on June 26. Texas historian Chuck Bailey said that left the door open for O’Daniel. “He knew Andrew Jackson Houston wasn’t going to last very long. That way he didn’t seem to grasping at the beginning,” he said. Now there was a special election for the open senate seat. O’Daniel announced he was running as did 25 other candidates – including an ambitious congressman from Johnson City – Lyndon Baines Johnson. “This is the beginning of Lyndon’s campaign for Senate in spring 1941 arriving in Austin,” said Johnson’s wife and future First Lady Ladybird in her voice tracking of the campaign home movies that she shot. “Here is another opponent W. Lee O’Daniel who flashed like a comet across the Texas political scene. Pappy O’Daniel – “pass the biscuits pappy,” she said. Johnson’s strategy was to out pappy Pappy with his own spectacular show. Johnson put on a two-hour long musical extravaganza that ended with him giving away money to the crowd. O’Daniel got new uniforms for his band and hit the road. Lou Mallory is the chair of the Wood County Historical Commission and she remembers as a child going to a Pappy O’Daniel political rally in East Texas. “I can remember that it was quite exciting and that everyone wanted to go – of course I was just a child but it was always fun because there was always a crowd there and the music you liked and everyone wanted the hear the hillbilly music,” she said. “Lyndon Johnson was the New Deal guy in Texas but Pappy ran against the New Deal he hated the New Deal,” Crawford said. The day after the polls closed on June 28 with 96 percent of the vote counted Johnson led O’Daniel by a little more than 5,000 votes. The Texas Election Bureau and the newspapers declared Johnson the winner. However, Pappy still had some biscuits in the oven. And some suspicious late ballot boxes from East Texas showed up that turned the tide for the flour salesman. On July 1, O’Daniel had overtaken the lead with 1,095 votes. “Pappy O’Daniel won. Some indication at the time that he stole a lot of votes in East Texas and there’s that famous story that Lyndon said he’s never be out-stolen again,” Bailey said. And O’Daniel got some help stealing that election from some unlikely allies. It’s been said that the liquor and horse racing lobby along with the Texas establishment conspired to deliver the needed votes for O’Daniel not because they supported him but because he was so damaging to their interests they wanted him out of Texas.